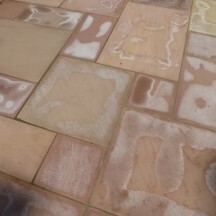 As a general guide, most sandstones, slates and granites can be cleaned as described below but it remains your responsibility to do the required test areas. For removal of Efflorescence use Builderase. As a guide, begin by diluting Builderase at 1:5 with water (one part product, 5 parts water). Apply to a stone where you can see efflorescence. You expect to see some "fizzing" as the product works.